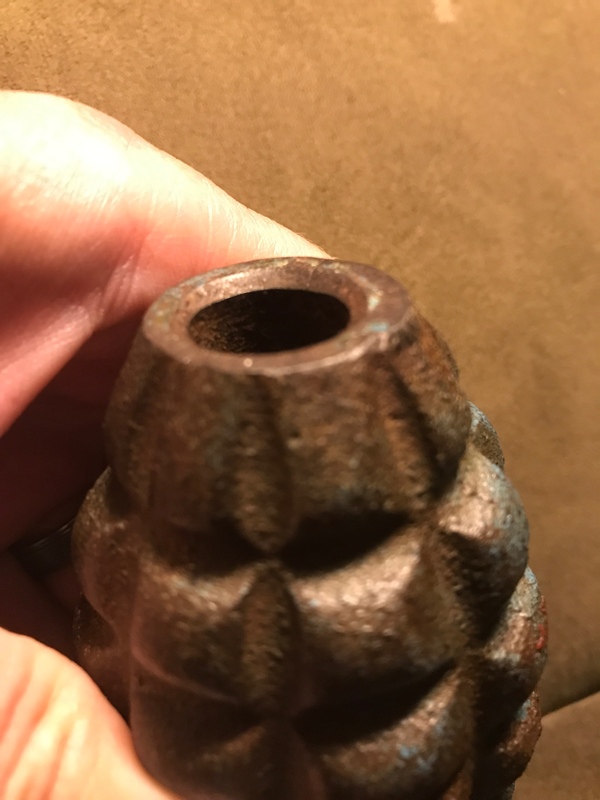 Are these legit or repro training grenades? Just got these and looking to sell. Still confused after reading a bunch on these. Real and value, please? Repro Grenades but the fuse on the second grenade look to be correct WW2. The 9/16 threads should not fit well into the repro body. Edited by Persian Gulf Command, 10 June 2018 - 02:41 PM. Looks like a real postwar M21 training grenade body. Note the beveled or chamfered edge on the bottom hole. It has been re-painted, the original blue is underneath. Value, probably around $30-$60 bucks. Not really sure on the value figure, been awhile since I purchased one. Edited by hink441, 11 June 2018 - 08:53 AM. 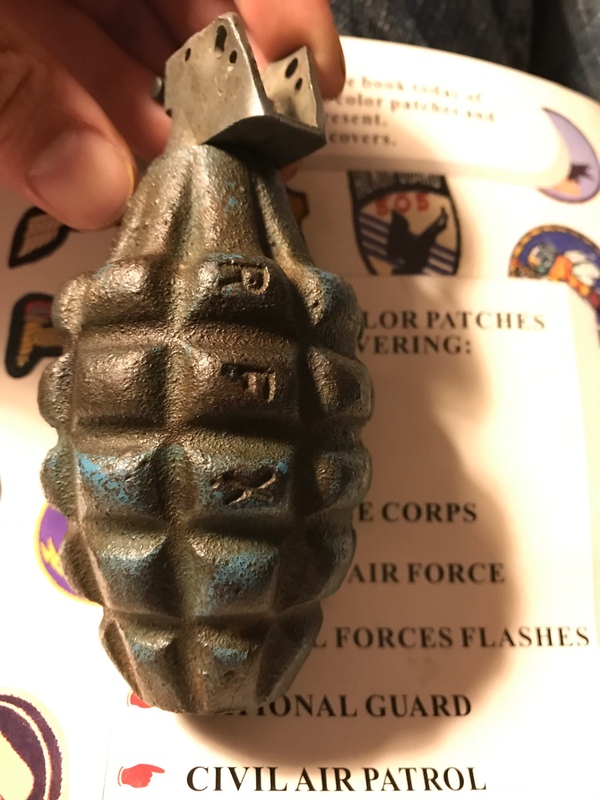 Original RFX training grenade,( the one with beveled hole) as Hinkle said. The bevel in the base hole and fuze type ( thread size) authenticate it as such. It should be blue in color....IF it was complete w/spoon and in original blue paint , $75 would be a fair starting price. 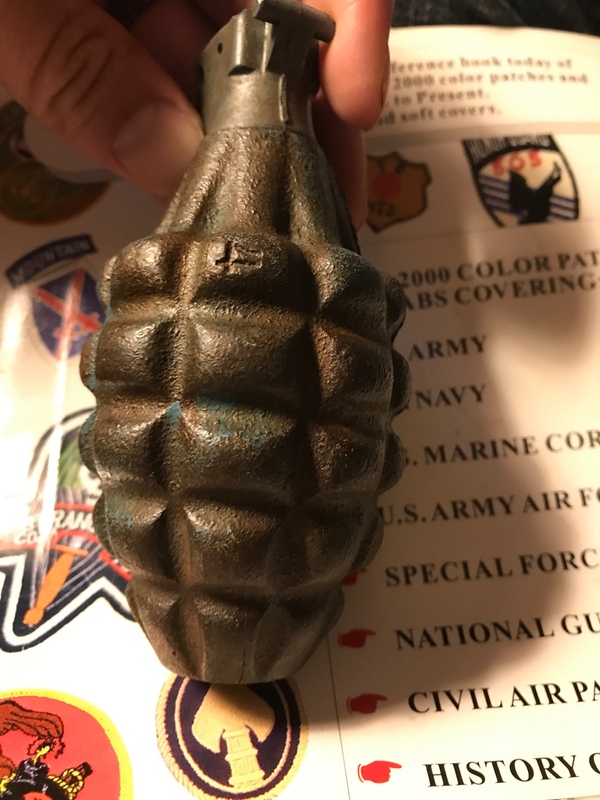 They are getting hard to find, and grenade collectors are a curious bunch, none I know have just " one"....if the upper one has an M205 fuze and beveled hole, it is also original, I can not tell by your photos. Edited by 917601, 11 June 2018 - 01:32 PM. Pic to help out. Original training grenades had a 9/16 thread ( about .550"), the common fake bodies all accept the 5/8 thread ( .620"). That is the first step, second, does it have a bevel in the hole to accept the plastic plug. Top fuze for the fakes, bottoms for post war trainers. ( M205). Edited by 917601, 11 June 2018 - 01:53 PM. Pic of the real deals ( the MKII trainer is early war, it has an M10A2 short spoon, rare find). Both M10 and M205 fuzes have the smaller .550" thread....and no " notch" for the safety clip. Edited by 917601, 11 June 2018 - 01:59 PM. 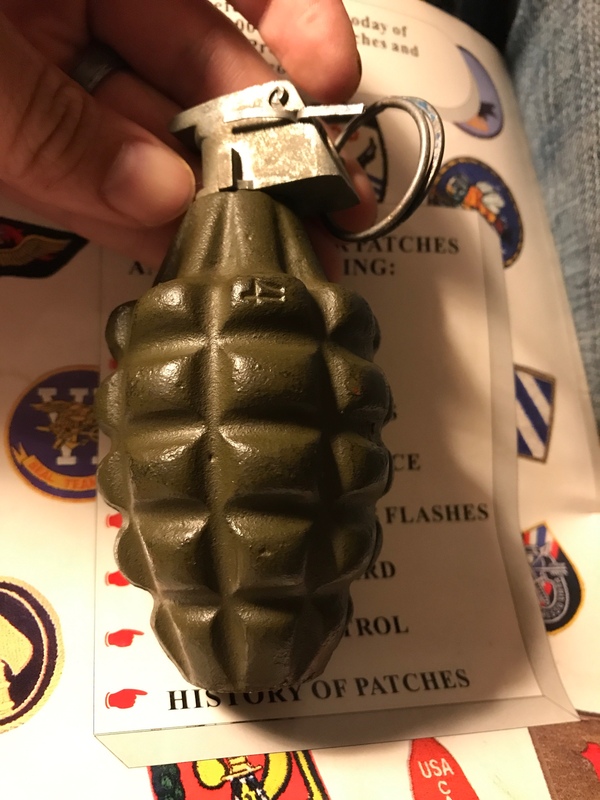 If your grenade body accepts this fuze, it is a fake, notice the safety clip. Edited by 917601, 11 June 2018 - 02:04 PM. Pic of the plastic filling plug, and the 1969 M205 fuze has the rubber washer to boot. 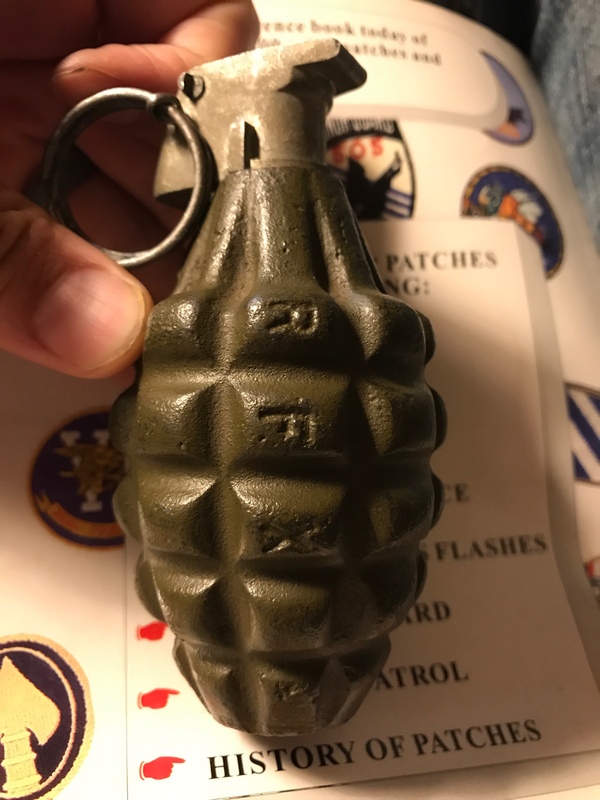 A complete authentic RFX trainer, bought from a Vietnam vet who no doubt forgot he had put it in his pocket while on the training field....RFX marked does not mean fake. There is a lot to this grenade collecting. Edited by 917601, 11 June 2018 - 02:17 PM. More, I will add. An original trainer (ww2- bottom) next to the RFX painted repro, notice the neck- the fake body indentations do not continue straight up to the fuze, same with the base, for some reason the fakes did not fully cast the indentations to the ends. See pics.Hope this puts to rest the every other week inquiries. Edited by 917601, 11 June 2018 - 02:30 PM. Yes, it does have the same edge at the bottom hole. Thanks very much for clearing things up. Honestly, this explanation was the most helpful so far. I took some more pics of my grenades, but it says the files are to large. Sorry. I use an iPad, some take, most don't. I have no idea how to get them to take ( I searched in this forum ) and am not really willing to spend a lot more time to some how resize them all. I have had over fifty rejected. Edited by 917601, 12 June 2018 - 09:14 AM. Finally, Grenades....Mills 1917, Mills 1945, Soviet Rg42, Soviet F1, US WW2 MK II, US early WW2 practice, US RFX 1969 practice, US M69 Vietnam practice ( FSN numbered), modern US M69 practice ( NSN numbered). Edited by 917601, 13 June 2018 - 07:45 AM. I noticed I had two Army 3", I switched one out for my WW2 Navy 3"AP. Reason, there is a lot of confusion between the Army and Navy 3" gun, this pic shows the big difference and answers a lot of questions. Notice the neck area and taper between the two. Edited by 917601, 14 June 2018 - 08:12 AM. Thanks for the pics and tutorial, most helpful. Thank you. It takes time but I have used this website in the past to answer questions and noticed the Ordnance section was " wanting". I am not an expert, but the BOCN website has many of them. My interest for the past few years is hauling out my ordnance to airshows and events for historical value, as few have seen Ordnace, it is always a hit. It serves no one sitting unseen in a garage or private collection. I encourage every one here to post pics of what they have....we all love pictures of historical interest. Edited by 917601, 14 June 2018 - 11:28 AM.